Wednesday November 28th 1923 I walked to town to do some errands and took a treatment of Dr Stryker. Came home in taxi. Mary & Fannie in Cedar Rapids. Busy knitting on bag. Thursday November 29th 1923 Thanksgiving day. Cora and Norma got up a fine dinner. The Nixon boys and Otts family here. William and Mary started home early as it began to storm. We hear they got there safely. Hattie down stairs most of the day. I finished my bag today. 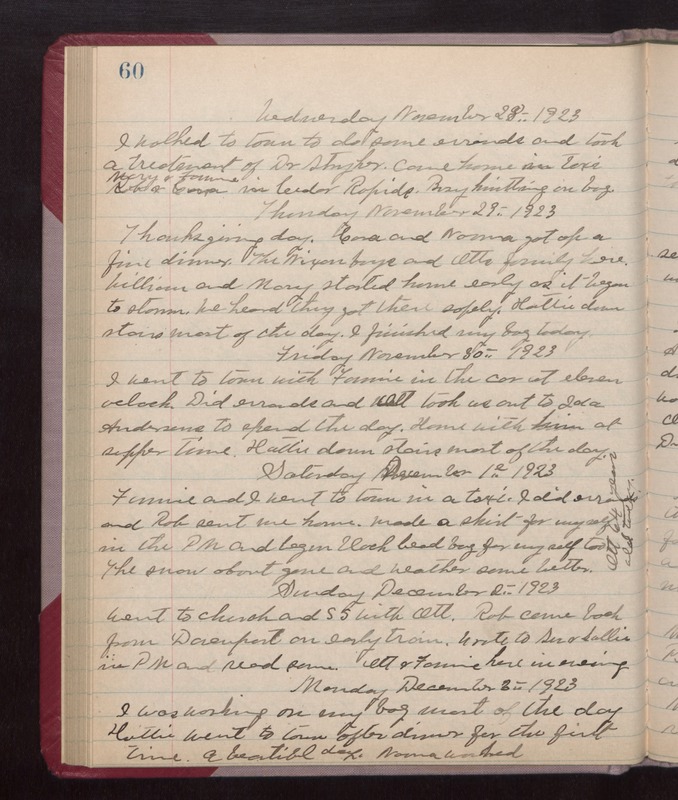 Friday November 30th 1923 I went to town with Fannie in the car at eleven oclock. Did errands and Ott took us out to Ida Andersons to spend the day. Home with him at supper time. Hattie down stairs most of the day. Saturday December 1st 1923 Fannie and I went to town in a taxi. I did errands and Rob sent me home. Made a skirt for myself in the PM and began black bead bag for myself too. The snow about gone and weather some better. Ott 64 years old today. Sunday December 2nd 1923 Went to church and S S with Ott. Rob came back from Davenport on early train. Wrote to Sue & Sallie in PM and read some. Ott & Fannie here in evening. Monday December 3rd 1923 I was working on my bag most of the day. Hattie went to town after dinner for the first time. A beautiful day. Norma washed.